Perfect cake for caramel lovers: 6 thin sponge cake layers filled with rich caramel frosting and topped with salted caramel glaze. Make the caramel frosting: Place 200 grams (7 oz) of sugar and 50 ml (2 fl oz) of water in a thick bottomed pan with high sides. 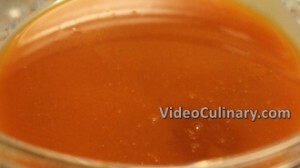 Melt the sugar over high heat and cook until the caramel turns to a deep amber color. Don’t remove from the heat. Gradually, and very carefully, add 300 ml (10 fl oz) of cream (min 30 % fat). bring to boil and stir. Pour into a shallow dish and refrigerate for 4-5 hours. 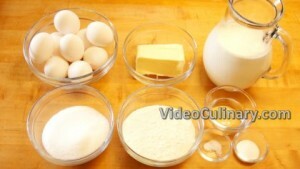 Make the butter sponge layers: Separate 9 eggs. Place 150 grams (5.3 oz) of soft butter, 100 grams of sugar, a pinch of salt and a teaspoon of vanilla sugar in the bowl of a stand mixer. Whip until smooth and light in color. While whipping, gradually add 9 egg yolks, mixing until incorporated after each addition and scraping down the sides of the bowl as needed. Place 9 egg whites in a separate bowl. 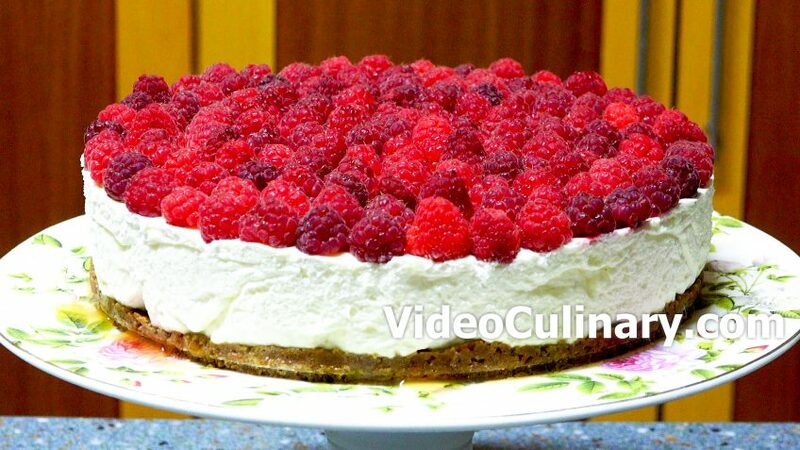 Whip until frothy, Gradually add 50 grams of sugar while continuing to whip, until stiff. Fold the egg whites into the butter mixture in 3 batches. Sift 150 grams (5.3 oz) of flour into the egg mixture. Fold until incorporated. 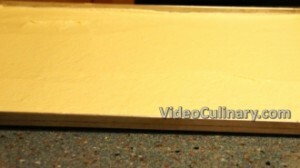 Pour the batter onto a 60 x 40 cm (24 x 16 inch) sheet pan, lined with parchment paper and brushed with butter. If you don’t have a large sheet pan, you can use two 30 x 40 cm sheet pans. Bake at 180°C (350°F) for 8-10 minutes, until light golden brown. Remove from the oven, cool slightly, invert and peel of the parchment paper. Cool completely. Cut into 6 equal parts. 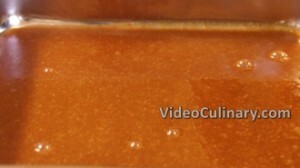 Remove the caramel mixture from the fridge and place in the bowl of a stand mixer. Add 500 ml (1 pint) of cream (min 30 % fat) and whip on high speed until stiff. 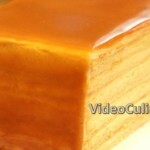 Assemble the cake: Spread ⅙ of the caramel frosting evenly over a cake layer. 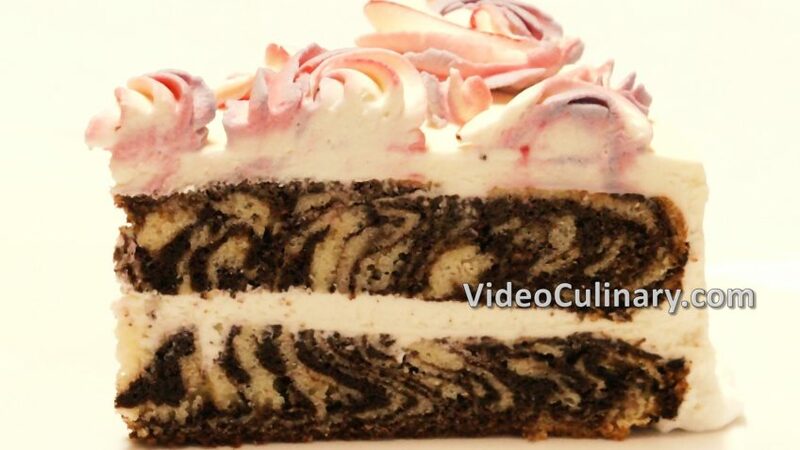 Set another layer on top, and continue layering with the remaining frosting and cake layers. 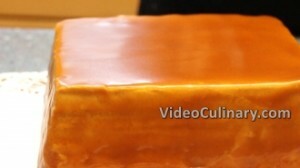 Cover the sides and top of the cake with the remaining caramel frosting. Place in the fridge. 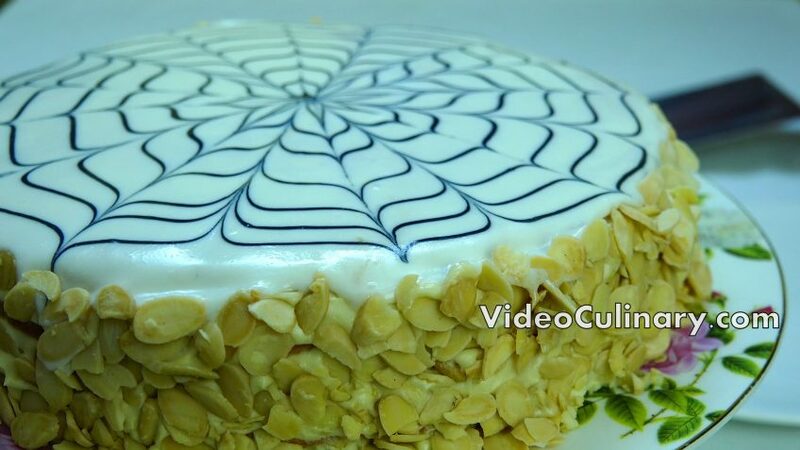 We are going to cover the cake with a shiny caramel glaze, but there are many different ways to decorate a cake. Visit the Decorating Cakes section on our website to find cake decorating techniques and ideas. Soak 5 grams of gelatin sheets in cold water. 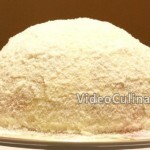 If you are using granulated gelatin, soak it in 50 ml of cold water. Combine 10 grams (2 teaspoons) of starch and 30 ml (1 fl oz) of water in a small bowl, mix and set aside. Place 150 grams (5 oz) of sugar and 1-2 teaspoons of lemon juice in a saucepan. Heat over medium heat until the caramel melts and turns to a deep amber color. Remove from the heat. 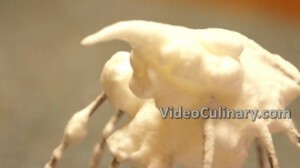 Carefully, gradually add 70 ml (2.5 fl oz) of water and 130 ml (4.5 fl oz) of heavy cream, stirring constantly. Add a pinch of salt and bring to boil, stirring frequently. Turn off the heat. Mix the starch and water and add into the hot caramel glaze. Drain the gelatin sheets and add. Stir to combine. 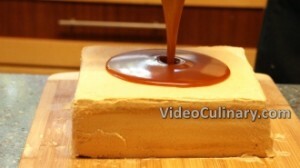 Strain the caramel glaze, and cool to about 30°C (86°F) . 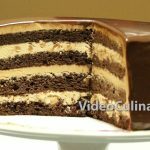 Glaze the cake: Pour the glaze into the center of the cake, and use a long metal spatula to spread the glaze over the entire cake. The glaze should run down the sides and cover the cake entirely. 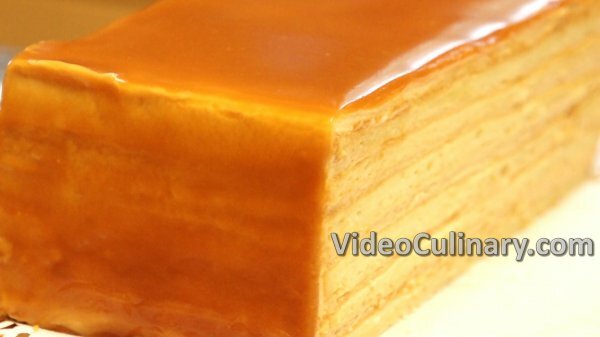 You can strain the glaze and cover the cake with a second layer. 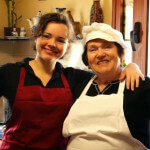 Place on a serving plate and refrigerate for a few hours before serving.